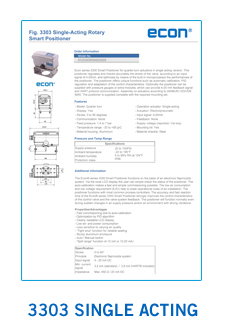 Econ series 3303 smart positioner is configured for rotary, single acting applications. This positioner regulates and accurately checks the angle of the valve, according to an input signal of 4-20mA, and optimizes by means of the built in microprocessor the performances of the positioner. The positioner offers unique functions such as automatic calibration, PID regulation and adaptation of the control characteristics. Optionally the positioner can be supplied with pressure gauges or extra modules, which can provide 4-20 mA feedback signal and HART protocol communication. The positioner is also supplied with the required mounting set.